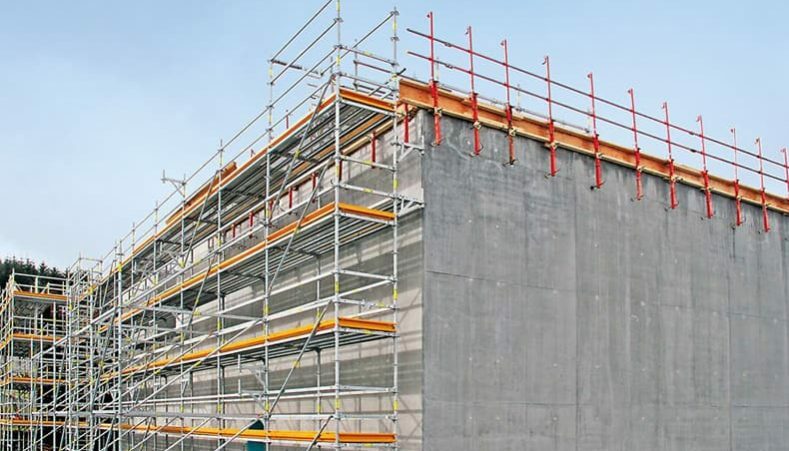 If you need to construct scaffolding for a repair project or a new construction, you may assume the best type of scaffolding is the general style that’s built from the ground up. However, there are a number of different scaffolding types and some of these may be better from your project than others. It all depends on what you need to do, the state of your building, and your location. Here are some of the different types of scaffolding and the situations in which you may use them. Supported scaffolding is what most people think of when they think of scaffolding and it’s the most common type. It’s built from the ground up starting with a sturdy base. It’s used whenever possible because it’s easy to set up, very safe, and very cost-effective. It can be built fairly tall, too, although you may need to insert extra support pieces if it’s going to be fairly large or if the scaffolding is going to need to support a lot of weight. Unlike supported scaffolding, suspended scaffolding hangs down from the top of the building or from the roof. It’s used in situations where you simply cannot build a tall enough scaffolding tower to reach the area and still be safe. It’s also useful on buildings that are built next to a body of water or for work on an offshore platform. Window cleaners also often use suspended scaffolding to clean the windows on very tall buildings. However, because it’s not as easy to set up, most people prefer to use supported scaffolding whenever possible. This type of scaffolding is similar to standard supported scaffolding. The major difference is that the bottom base is on wheels. This means the scaffolding can be easily moved. It can’t be built as tall as supported scaffolding because the top wouldn’t be as secure when moved. However, it’s very useful for tasks such as painting because it can easily be moved when needed. This makes it quick and easy to paint the second story of a building without breaking down the scaffolding and moving it over. Rolling scaffolding does have locks on its wheels so that the structure is stable when it’s in use so it is very safe. It’s also very convenient and is often used when working on a project that covers a good amount of distance. Mobile scaffolding is designed to be quickly moved. It’s different from rolling scaffolding because it doesn’t have wheels on it. Instead, it’s designed to be assembled, used, and then disassembled and moved to another location. It takes very little time to put together. What it gains in speed, though, it does lose in stability. Scaffolding designed to remain in place is much steadier. Even rolling scaffolding may be safer than mobile scaffolding in some cases. However, for projects that do require putting up scaffolding for a short period of time, this may be the best option. This is especially true if the scaffolding doesn’t need to be very tall or hold a lot of weight.